Most people barely even know that they’re Viking dishwasher has a door switch, at least they don’t until they try to do a load of dishes and find out that the door switch isn’t working. These little devices might not be well known, but they’re an important aspect of keeping your Viking dishwasher running smoothly. The most common indicator that your Viking dishwasher’s door switch isn’t working properly is that the dishwasher won’t turn on. The purpose of the door switch is pretty simple. It holds the door tightly closed and sends the signal to the control panel that the machine can safely start. The door latch is a key component that prevents the machine from leaking water and soap suds all over your floor each time you clean up after a meal. At first glance, the door switch seems small and unassuming. 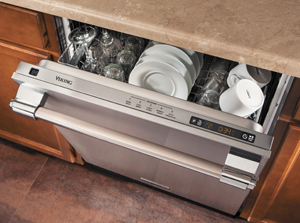 Its diminutive size makes it difficult to grasp that it’s at the root of all your dishwasher problems. Most of the door switches found in Viking dishwashers are about an inch long and have small metal prongs that poke out of the body and are designed to fit into slots carved into the dishwasher’s frame. When we get a call from someone in need of Viking dishwasher repairs and the door switch is identified as the problem, we take a careful look at the switch and make sure the prong hasn’t come loose or gotten bend. Before we can gauge the true problem with the door switch, the dishwasher needs to be disconnected from the power source. Another common Viking dishwasher repair issue is an appliance that no longer drains properly. Sometimes this is a result of a mechanical problem with your dishwasher, while other times the problem stems from a plumbing problem. We can help you determine the source of the drainage problem and correct. When the problem stems from plumbing, we commonly find that the drain pipe has become blocked, making it impossible for the water to exit the dishwasher. If your dishwasher is set up to drain through your garbage disposal, turn on the disposal and see if the dishwasher drains. If this corrects the drainage problem, you should plan on turning the disposal on and off half a dozen times or so to resolve the matter. The next thing we look at is the air gap. If we see water in this space, we know that the clog has to be located between the garbage disposal and the air gap. We can usually quickly and easily correct this particular drainage problem by snaking the tube and forcing the clog to relocate. If we still haven’t corrected the drainage problem, our next step is checking out the dishwasher drain connection which can be found between your garbage disposal and the dishwasher’s drain tub. If we find a clog, we push it free of the drain connection and you can enjoy a properly draining dishwasher. If none of these simple fixes work, our Viking dishwasher expert turns their attention to mechanical reasons for the failure to drain. The most common mechanical reason for the drainage problem is a faulty pump that will need to be repaired or replaced. We have received quite a few calls from local residents who have developed Viking dishwasher repair issues that ultimately turned out to be connected to the heating element which is responsible for keeping the water flowing into the machine at the optimal temperature and making sure the air inside the dryer stays hot during the drying cycle, which causes the water to evaporate faster so your dishes dry faster. When the heating element within a Viking dishwasher isn’t working properly, the dishes won’t be as clean as they were when all systems were perfectly functional and all of your dishes will still be damp to the touch, despite the fact that they went through the entire drying cycle. When we determine that the problem really is the heating element, we will either replace or repair the part. Whichever option we choose, you can rest assured that we’ll only use parts that received full certification from the Viking company. Just because your Viking dishwasher isn’t working flawlessly, it doesn’t mean you need to invest is a brand new model. Thanks to the repair services of Ameripro, you can repair the unit for a fraction of what you’d spend on a brand new model and continue to enjoy the dishwasher you love for several more years. Troubleshooting your Viking dishwasher isn’t nearly as difficult as you might expect. The thermostat isn’t working properly and as a result, the water isn’t as hot as it should be and cooler water causes many dishwashers to leak. If this becomes a constant problem, you’ll want to call our Viking dishwasher repair office and arrange for an appointment. We’ll be able to determine if the problem could be a faulty door switch or seals that are no longer sticking properly. One of the hoses connected to the dishwasher has become blocked or kinked so the Viking dishwasher isn’t getting the water it needs. Check out the overfill float and make sure it has gotten stuck, which would make it impossible for the dishwasher to determine how much water is in the machine. Before you do anything else, you need to find the paperwork you received when you first purchased your dishwasher and reacquaint yourself with the warranty information. If the warranty is still good, you need to contact Viking and alert them to the situation. Based on what you tell them about the problem, they’ll either repair the appliance or set you up with a brand new one. Either way, Viking foots the bill. You DO NOT want to try doing any work on your machine if it’s protected by a warranty. Any tinkering you do to the dishwasher, no matter how meaningful, will result in the warranty being voided forever. If the warranty has long since expired, you have to decide whether or not you should tackle the project yourself, or if you should call us and have us handle all the work for you. One of the first things you should ask yourself before embarking on a DIY Viking dishwasher repair project is whether or not you have the experience and knowledge needed to accurately diagnose the problem and test the connected parts. Without this knowledge, you could spend an enormous amount of your time poking around the inside of your dishwasher trying to isolate the problem. We have spoken to people who thought they’d accurately pinpointed the problem only to later learn that they replaced a perfectly good part and never corrected the actual problem. When you glance at your Viking dishwasher, it might not look like a very complicated appliance and there was a time when they were simple, but times have changed. Technology has improved, and now your Viking dishwasher is a complex unit. Today’s washing machines do an excellent job was dishes, much better than the machine your parents used when they were children, but the tradeoff is that repairing Viking washing machines is more difficult than most people expect. The good news is that as a resident or business owner, you’re able to utilize our high quality, low stress, affordable dishwasher repair services. We don’t care if your dishwasher has developed huge issues, or if the problem you need to be corrected is minor, we’re here to help. Since opening our doors, we’ve repaired thousands of Viking washing machines and are pleased to report that every single owner of the machines we’ve repaired are happy customers. The sooner you contact us, the sooner you can go back to a life where you don’t have to worry about washing dishes by hand. The sooner you contact us, the better. Feel free to use the provided online scheduling form or call us to book an appointment. We understand how much your rely on your Viking dishwasher and how stressful life becomes when it’s not working properly which is why we do everything in our power to swiftly and accurately repair the issue. We’re confident that when you ask your friends and family members for Viking dishwasher repair service recommendations, they’ll urge you to give us a try. Most of our new clients have come to us as a direct result of word of mouth recommendations. Whether your Viking dishwasher won’t turn on, is leaking, has started making a wide assortment of strange noises, or is leaking, we’re ready and willing to lend our assistance. We’ll do everything in our power to get your dishwasher up and running again. The speed and accuracy of each of our repairs. Since we first opened in Orange County we have worked hard to become the leading Viking repair experts in the city and we’re pleased to have met our goal. Now that we’re the best, we’re determined to remain the best in the city, which is why we maintain the same high standards for repair work and customer repair work that we’ve always had. Our commitment to these two things is what keeps our customers coming back to us for all their Viking appliance repairs.